If I could pick a theme song for today, it was “Damn It Feels Good To Be A Gangsta” by Geto Boys off the Office Space soundtrack. It's from a montage scene where Peter appears to be living a care-free life at work, knocking over his cubicle walls, and outside work, fishing with Jennifer Aniston. I slept in on my first weekday without a job, woke up feeling as though I'm 99% complete with trip preparations, drove (traffic-free) into DC to apply for my Chinese Visa, pulled into a parking spot a 1/2 block away, was the last person in the queue to submit my application by the 11:30am cutoff (for same-day service), spent the next 2.5 hours exploring Georgetown (see below for details), picked up a great new Patagonia daypack, paid $130 to get my passport back (w/12-month multi-entry Visa), drove home with little traffic, and was all but sold on keeping Sprint service with only their $4/month flat fee for international calls (plus local international rates, and no contract, for emergency use only). After dropping off my passport, I drove the short distance down Wisconsin Ave to Georgetown. I seemed to automatically slip into curious, observant backpacker/vagabond mode, slowing my pace down, walking along the empty waterfront in the chilly drizzle. I came across the House of Sweden (aka Swedish Embassy) which had fantastic architectural qualities like glass exterior panels which served absolutely no structural purpose. 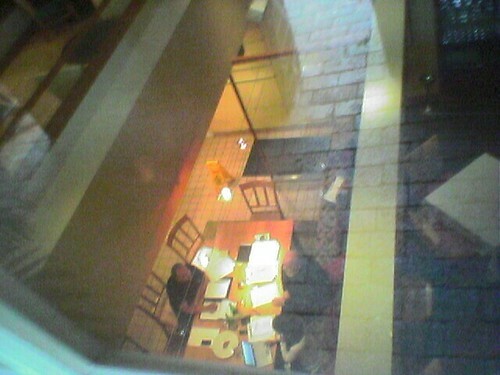 I happened across Citronelle restaurant (one of the best in DC, if not the USA), and curiosity lead me to look inside, along the windows, which allowed me to catch a glance of world-renowned chef Michel Richard conversing over papers on the lower level (perhaps picking out the menu for the evening?)! As I criss-crossed streets, memories of past experiences in the neighborhood came back to me. 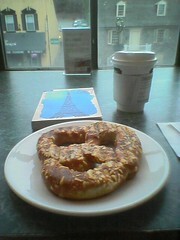 I bought a sourdough Asagio pretzel and coffee at Barnes and Noble, over which I read a few funny short stories in a Lonely Planet compilation “By the Seat of My Pants,” edited by Don George (who was also in the same NBC news bit I was part of). I made use of the restroom too. I stopped in the Patagonia store, and came across a great little daypack which I bought. I had planned to stay with my Jansport canvas bag after returning a small messenger-style bag from REI (because it was too small, heavy and not as comfortable), however the Patagonia one fit my litmus test: 1.5-liter bottle of water, my jacket, with room for a notebook, guidebook, and camera. It has padded back support, and two adjustable support straps, which will make it more comfortable than the Jansport, plus while slightly heavier, it rolls up about the same. At $50 it was a little steep, however I'm confident it presented itself to me today for a reason! 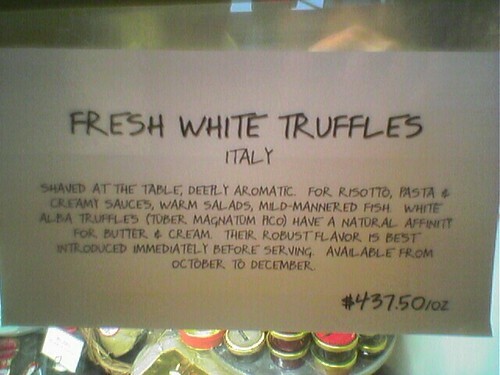 With new daypack and water in hand, I stopped into Dean & Delucca to ever-so-briefly contemplate the purchase of 1-ounce of white Italian truffle for the cost of a month in India ($437). I made my way back up Wisconsin Ave, ducked into Whole Foods for a few free samples of cheese, and then to the Visa office which had a short line for payment and pick-up of passports. Earlier, upon applying, the lady had only one question – was I employed? I had listed “independent traveler” as my occupation. :) I responded that I was unemployed, and traveling for 12 months, and that's all there was to it! I have become strangely addicted to your blog as a procrastination tool and a way to help me work through post-RTW-traumatic-stress-syndrome (surely its a real problem). I live in Christchurch, NZ and work part time as a bike tour guide around the city, get in touch when your down this way and I’ll try hook you up with a free tour. Arnika – I must be doing something right if you’ve stuck around so long, given you just wrapped up your own RTW trip! Maybe given your travel plans, we’ll even meet up on the road (that must be like a bullet hitting another bullet from opposite ends of the Earth, though still possible!). Your Nepal/Annapurna photos look fantastic, I can’t wait to collect a few myself. Did you have any trouble acclimatizing? Which trekking company did you use? And did you go with just a guide/porter, or a group tour? Nepal was sweet for acclimatizing, not nearly as bad as Bolivia, where I was about 8 months prior, maybe I was used to it by then, but you can never really tell until your there, and theres nothing you can do about it. I didn’t meet anyone with probs though. I knew some (Nepalese) people in Pokhara so we just bought a map, pretended he was a guide and went. Think its best (and cheapest) to find some people at a guest house and share the price of a guide, there seemed to be lots of people looking.